It needs courage, character and idealism to forsake urban comfort and move to such a beautiful, but harsh place. Yet coming as an outsider to a remote village, Malika has taken up women's and environmental issues and is working towards bringing a change in the lives of the womenfolk. Claude Arpi and Abha Tewari discover a lady who left the city for the mountains and is tackling the problems confronting the locals as her own. Continuing our series on Extraordinary Indians. You wear several caps: you were a sarpanch (elected village head person), you are a mountaineer, you are working on women's issues. But before going into this, tell us about your background? For me, it is a question of identity. It means who am I? My cultural roots were in rural Punjab; but it was not obvious. We lived in Delhi, we travelled around. The first assertion of my identity came in 1984 when I realised that I belong to the Sikh community, a minority community. 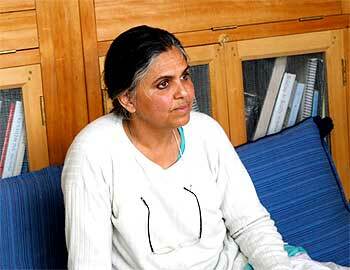 It was quite different from having a free-floating identity as an urban woman or just a Punjabi woman. In 1984, after Indira Gandhi's assassination, when the Sikh carnage took place, it became very clear to me. I came face to face with my roots. You were a student at that time? No, I was working in the resettlement slums in Delhi. Many Sikhs got massacred at that time. I lived close to the area in East Delhi (where many massacres took place) and I spent three nights waiting with my father and my mother. I thought: 'They (the mobs looking for Sikhs) will come'. We had just moved to the areas six months earlier; we could see houses burning, people with broken legs or arms being carried away. We were just waiting and not sure (what will happen to us). At that time, I clearly realised that I belonged to a minority community. I am a Sikh and it has a meaning. It is not just a surname that I carry around in life. Apart from that, I always lived in an urban area, my parents lived in Delhi, but grandparents were farmers (in Punjab). I was twice removed from the land. I started working in Delhi after my MA in Social Sciences. I did my MPhil and wanted to do a PhD. But I wanted to 'work'. I was interested more by action than research. I stopped my studies, went into activism. Tell us how you decided to leave Delhi and come to Munsyari, this remote part of Uttarakhand. I was working in Rajasthan on a Women's Development Programme and came to settle here in 1992. Theo (Malika's husband) was in Anand in Gujarat with the National Dairy Development Board. We decided set up home in the mountains. He had a project and I came to settle here to be a farmer and mother. I had never done farming before, but I thought that it was the right thing to do. It was not really significant that this place was very remote. There was a lot of romanticism involved. In 1993, we bought a piece of land and built a small room in 1994. How did you get involved in local politics? You were a sarpanch (head person of the village forest council or Van Panchayat). What does it mean to be a sarpanch? Sarmoli is a remote mountain village. The subsistence economy is such that you need a forest to support it. 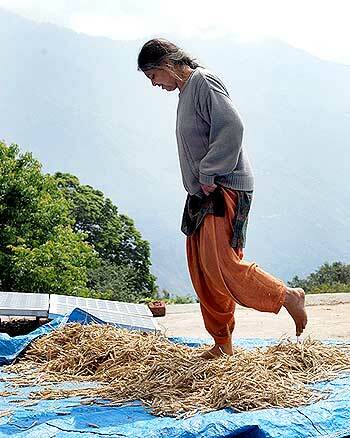 It is the way agriculture has been going on in the Himalayas for a long, long time. After a struggle during the British Raj, the people managed to get community forests legally notified: this is called the Van Panchayat. This happened in 1931, and our village Van Panchayat was notified in 1949. Each village community has a support forest area -- in our case 34 hectares -- and it is governed in a democratic way. We have elections every five years. A council is elected and the head of the council is called a sarpanch. What was your experience here like? The early days? I completed my five-year term. I like to work with communities and take up causes as they come, but as a citizen, not as someone who is getting paid. I work more on the political level, though on the same social issues. I am on my own and not part of any large institution or political party. It is the same for women's issues. Keeping my autonomy has been central to my beliefs. When I came here, I did not join any organisation. It was hard, I had no work. I took up farming. I basically wanted to be part of the community. I was persona non grata for five years. I did not belong to the urban area, neither did I belong here. It took time for me to get really accepted. After 5, 7 years of checking me out, (they realised) that I did stand by what I professed. It is always easy to talk principles, but more difficult to stand by them. The community looks at action, not talk. The reason why they made me sarpanch, besides the fact that by that time I had been accepted by the community, is that nobody wanted to be the sarpanch. It is interesting. When there is money coming in for development in the Gram or Village Panchayat, you cannot only make a 'political' career, but you can also 'earn' something (out of it). In contrast, the Van Panchayat has no money, we are working for the common property and do not get state funding. There is no money allocated from anywhere. So nobody is eager to be the sarpanch. In our village, because we are close to the town of Munsyari, people prefer to be where they stand a better chance (to make money). The Van Panchayat is -- or was -- a losing proposition. Not only do we not have (development) money, but people usually do not want to work together. It is an eroding culture. When I became sarpanch, the community said: "You are talking so much, now show us." Personally I was very excited. Because I did not have 'political' ambitions, I was able to mobilise the community, first the women and the youth of the region. Do you think that women can do better than men to bring people together? I wouldn't say that, but women are more dependent on the forest, so it made sense to respond to me (as a sarpanch). In our area the economy has not been monetised that much, there is still the remnants of the concept of shared labour. Yes, it is, but women are still ready to share labour and are more dependant on the forest. As a woman, I was also ready to give them space, not just the rhetoric. Still women were cynical at the beginning. 'The village won't change, there will be no turn around,' they said. What we managed in five years is that a third (or perhaps half) of the village has really changed. Today, there is hope. People want to keep the Van Panchayat going. Some will still say cynically, "Go ahead, since you are so keen!" But there is change. Is there still an exodus towards the cities and the plains? Yes, agriculture is only subsistence agriculture, you can't make cash. It is a problem. It is one of the experiments of our Van Panchayat. To be meaningful, one should get something back from the forest. It is too small to meet all the subsistence needs of all our right holders of fuel-wood and fodder; too many people depend on a too small land. We had to find some environmentally non-extractive way to get benefits to as many people as possible. Tourism was a good option. We have organised it involving the community of right holders. It means that benefit comes to the community at large. Some 50 families out of the 300 are benefiting directly. We have a home-stay programme with 25 families on the roster. We also have 25 families where young men or women work as porters and guides. They are trained. They can also plan logistics for different types of treks. These are two aspects: The home-stay where visitors share food, house, skills, crafts, etc with the host family and the second one is the logistic for treks. 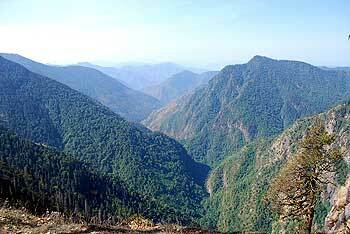 The Uttarakhand government is planning to develop tourism on a much larger scale. What are your views? Is it not destructive? As the government created SEZs (Special Economic Zones), the state today speaks of STZ (Special Tourism Zones). This is typical top-down model of planning and development. It is the wrong way to go. All the benefits are kept at the top and little 'trickles' down to the bottom. Only the crumbs reach the communities; and that's what the Uttarakhand state government is trying to do. But the government also knows that eco-tourism has potential. We find some support with the forest department, perhaps because eco-tourism is fashionable. We have received some money for a community centre. In a way it has validated our endeavour, but it is too small. 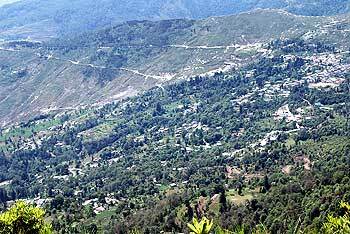 The main thrust is with the big tourism industry which is based in Nainital or Dehra Dun. Could the government make Munsyari, a Nainital? Many people are turning their houses into lodges or hotels. If one does not watch, the same thing will happen in Munsyari as elsewhere. But it will be overkill. The tourist capacity in a place like Munsyari is limited. Take water. We had never heard of water shortage until five years ago. Whether it is because of global warming or other problems, it is becoming an issue. 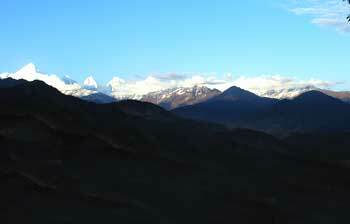 Image: The peaks of the Kumaon hills. What are the main women's issues in Munsyari? >Broadly the same issues as anywhere else in India. Violence does not seem to end. Deep patriarchal perspectives in the villages legitimise any degree of violence against women. When I first came, during the first six years, I observed that there were six brutal murders, and the police did nothing. At that time, I had no credibility as I was a newcomer to this community. What was the motivation of the murderers? Mainly for marital affairs. The man had another woman and wanted to marry again. The first time, I got involved is when there was a brutal murder in the bazaar; everybody was horrified; people had seen the woman's dead body, but nobody wanted to say anything. There was a complicity of silence. I had the same question, should I speak? I felt it was time to speak up. I noticed that people need a catalyst; there is some cynicism which believes people do not want to speak, but they do. Someone has to start. In no time, we were 40 women going to the police station asking for a post-mortem; what was the state doing etc? Since then, we never looked back. 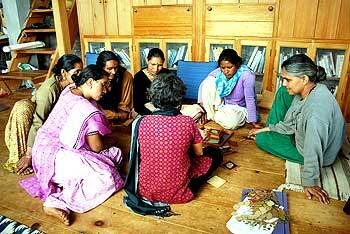 We have a small organisation called Mahila Sangathan. We are thinking of registering it, because we now have a public profile and there is antipathy to what we stand for in some quarters. For our own safety, we need to be registered; our accounts have to be officially audited. Even if we generate very little money, we need to be able to show where we are getting funds from. The first issue is violence against women. The second issue is liquor. In the mountains, people have always brewed their own liquor. It is part of the culture of the Bhotias, a local tribe that is a Scheduled Tribe. It makes sense when it is cold, life is tough, but now the growing problem is the commercialisation of liquor. When there is already poverty, when the minimum wage is so small, when people are in a general state of hopelessness, they then take to drink -- it often results in violence against women, and then there is a problem. It is not just a women's issue, though women take the brunt of it. It is an economic and political issue. I am a feminist, but I believe that it is not only gender which traps people. It is as much the caste, class, and poverty related. We have to look at life in a multidimensional way. Many women's groups -- like ours in Munsyari need to liberate ourselves, we invest our energies on our issues and problems; and society will change only when we have a critical mass. We have to change the way society sanctions things. If you stand up and say, "I don't agree," after sometime, you find that there are 10 people who do not agree, and after a while many others begin to stand up. Times change. That is what we are fighting for. Do you see any change with the spread of education? Definitely. It has been a very important factor, even though our educational system is not in a good shape, even though we don't have enough teachers. Nobody wants to come to such a remote place? Yes, this is a genuine problem. But, just the fact that girls can now step out, that they are no longer restricted to private spheres (of the household); the fact that schools are for them as well, this has brought a big big change. They are not fully educated, but they have stepped out. Amongst them, the more assertive can move ahead. That is good, though the quality of education in general is bad, but there is now an opportunity for them. In India, there are many new rich people. Do you think they are happier than mountain folk? I would say: It depends what you are looking for. What makes you happy? The problem is: Do the people here have a choice? If you asked them, they would like to be better off. The confusion comes when happiness is equated to material well-being only. But material well-being is also critical. That is the crux. If you have no money, you are struggling and it is an unhappy situation. One could romanticise poverty and say: "They are happy with so little!" One is not happy with too little, but to get what people get in Delhi and still wanting more, does not provide happiness either. If you are looking for money only, you are in big trouble because there is no end to what you want. What brought you to mountaineering? I grew up with my grandmother in Dehra Dun. I liked to walk in the forests. In school, I started rock climbing, then I did my mountaineering courses. At that time in India, it was hard to be a woman mountaineer. It still is! Either you are part of a club and a club culture, where everything is laid out for you. (In this set-up), women have their place and remain in their place. If you don't belong to a club, if you are not patronised by an institution or the army, you are left to your own strength. Though mountaineering is about physical ability, but it is not the reason why you are usually selected for an expedition. You are called because you are someone's partner or daughter, or for a funding purpose. A woman is needed on the team to secure sponsorships. If you want to do mountaineering for the pleasure of it or the adventure, it is hard to find a group where you will be valued for what you are, not just for your 'label'. I did my basic and advanced mountaineering courses, a few expeditions, but I was choosy. I was not ready to do anything to get on an expedition. I like to do it the way I believe it should be done. Some people take to mountaineering not to challenge themselves, but to 'vanquish' the mountain. They say they have 'conquered' a peak. Sometimes even, 'a virgin peak'! This is patriarchal; it is like 'conquest' during a war. I look at it the other way around: There is only yourself to 'conquer'. You vanquish your own fears, your own limits. It is for the challenge of conquering yourself that you are there. Then I feel physically alive.